Phil Von is proud to present the project "Made Underclouds". On this special double album features a selection of music pieces which the composer wrote for 3 major performances of the French street-theatre company Underclouds. On one C.D you will find the full soundtrack of the acclaimed "Funambus" show and on another C.D are brought together the upgraded re-sculpted and remixed best soundtracks of the shows "Petites Histoires Sans Gravité" and "VerSant" (2016 / 2018). “Made Underclouds” is a voyage on the “other side”, across miniature odd retro-futurist melancholic tales, written under the influence of inspiring clouds. If you wish to visit another side of the musical ventures of the composer and discover the sonic world of this amazing new-circus company, this opus will transport you across the dream-like melodious atmospheres of a contemporary poetical «electronica». Visuals by Salt and mastering by Norscq. 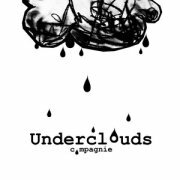 Underclouds was born from the dreams of two circus artists, Chloé Moura, a fildefériste and Mathieu Hibon, a tightrope walker. For their first co-creation, they invented the "Funambus", a bus on top of which they grafted a cable allowing them to remain free and play almost everywhere. This street show for big squares has been running for 6 years in France and Europe in front of tens of thousands of spectators. For their second creation, they present "Petites Histoires Sans Gravité"inside black boxes, working around an unusual & very physical discipline, 3 aerial acrobats walking upside down “beneath” the ceiling, with a hypnotic soundtrack by Phil Von. In 2018, the next creation of the company, "VerSant", is a landscape circus project. Written by 4 hands with Diane Vaicle, artistic collaborator and long-time friend. Setting up a table in every sense of the word is the new challenge. In the middle of the nature, a huge banquet wedding table is tilting slowly… finally becoming a vertical wall. Flamenco dancer, singer, performer & composer, Phil Von founded the company Von Magnet in London in 1985. With Von Magnet he released a dozen of records (fusion of electronic, flamenco and theatrical music), co-wrote and toured many theatrical concert/performance pieces across Europe. As a solo artist, he is performing & composing for various dance or theatre companies as well as producing his own solo works, a mirror to his active creative participation to many performance projects. With Somekilos he launched the electro tribal duo Meta Meat in 2016. He is currently co-directing and composing with his partner Sakurako for the butoh dance- theatre company Okarukas in Lithuania. This crownfunding campaign will be used to mix the album, press it, design it and send it by post. We will offer the CD in pre-sale before its official release as well as unpublished stickers from the company and postcards of the various shows. We will also offer posters and/or t-shirts for larger donations. Then, as an ultimate counterpart, we will offer the most generous donors the opportunity to attend one, two or three shows in an exceptional place, that is, behind the scenes, as close as possible to the acrobats or inside the bus. A private mini-concert with the musician is also planned. Our infinite gratitude and a big kiss. The double audio CD "Phil Von - Made Underclouds"
+ attend the Funambus show from the inside or small stories without gravity from behind the scenes.